Ash Wednesday is March 5. Masses will be held at 6:30am, 9am, 12noon, 6pm and 7:30pm. Ashes are not distributed at times other than following the Masses. Join us for our Lenten Soup Suppers beginning this Friday, March 7, 6-7:30pm in the Parish Life Center, followed by Stations of the Cross in the Church at 7:30pm in English and 8:30pm in Spanish. Since this is first Friday, Mass is at 8pm and all-night Adoration will follow the Stations beginning at 9. Please sign up in the vestibule of the church for your time. The St. Mary Manna Food Project will collect nonperishable food items and financial donations next weekend for the Fredericksburg Area Food Bank. 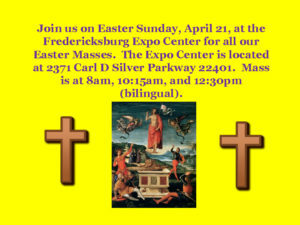 Volunteers will be available before and after all Masses to accept your donations. Couples from Worldwide Marriage Encounter will be available March 8 and 9 after Masses to provide details about the upcoming Marriage Encounter Weekend, which will be held in Fredericksburg in April. All married couples are invited to stop by the Courtyard Meeting Room after Mass next weekend for more information. Join Fr. Rooney for five Sunday night classes during Lent on enriching your knowledge of the Mass through Sacred Scripture. Please, you must sign up by this Thursday, March 6 to determine if we have enough for a class. We are sorry for the short notice! 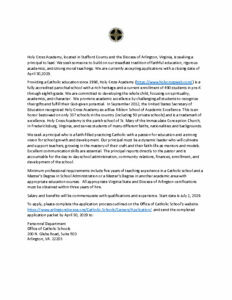 Call the office to register, more information in this bulletin, p. 6. SCRIP is on sale in the Parish Life Center after all Masses except Saturday 7pm and Sunday 2pm. Please use SCRIP, and a percentage of what you spend will be applied to our school.